Weehawken, N.J. is a more beautiful place thanks to the Elks! Using an Elks National Foundation Beacon Grant, Weehawken, N.J., Lodge No. 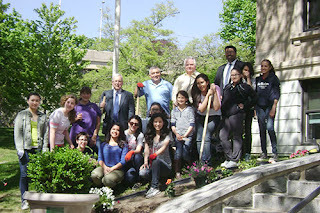 1456 partnered with local Boy Scouts, Girl Scouts, a teen peer leadership group, and other high school students to plant a garden surrounding Weehawken Town Hall. The students gave this project two green thumbs up! They enjoyed digging in the dirt, and working alongside other local youth and the Elks. 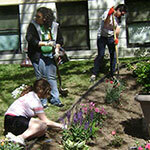 To keep the plants and their new friendships thriving, the Elks plan to tend to the community garden year-round. Does your Lodge want to be featured on the ENF blog or other ENF pages? Simply submit fabulous Final Report Forms! Include project successes, feedback from the Lodge and community, and photos that we can share with others. Be sure to have all 2012-13 Beacon, Gratitude and Promise Grant Final Report Forms submitted by Saturday, August 31, to be eligible to apply for 2013-14 grants and for the chance to be featured on the ENF website, Facebook or Twitter!